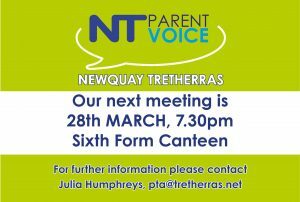 Newquay Tretherras School Parent & Teacher Association (NT Parent Voice) would like to welcome you to the school, whether your child is just starting or if you have other children already here. We are a group of parents and teachers who meet half termly to discuss school issues ranging from uniforms, trips & visits, financial aid to future projects at the school. We also run fundraising events to support the school and student activities, as well as help serve refreshments at various sporting and musical functions. We warmly welcome your support even if it is for just one day or for one evening a year. We believe it is a great school, and encourage you to join us in support school projects. We organise and run one major fundraising event a year which is the annual Winter Craft Fayre and the annual Table Top Sale. Both events run for 2 days towards the end of November. The monies raised are then made available to subject departments in the school to bid to enhance curricular and extra-curricular opportunities for all students in all years. We also encourage individual requests for funding from students who need financial support for a specific experience, representation or opportunity. Recent ventures which have been financially supported by NT Parent Voice have been; Ireland U15 Rugby Tour, Project Fred – restoration of a light aircraft as part of the school STEM project, Screen Printing equipment in Art, Bluetooth Speakers for school productions, Year 9 student on the County Schools Cricket Tour to South Africa, Year 10 student representing England Football, 3 students on a Camps International Expedition to Ecuador and many, many more. To express interest in booking for 2019, please email pta@tretherras.net with your name, address, contact number and details of your requirements. To book for the 2019 Indoor & Tabletop Carboot 2019, please email pta@tretherras.net with your name, address, contact number and details of your requirements. All bookings must be made via the online booking system. No Cheques or Postal applications are accepted.